An author comes to Westpark. On Wednesday we unveiled our revamped school library. 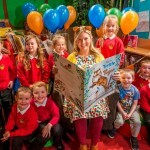 We celebrated by hosting a mini book festival, headlined by acclaimed children’s author, Pamela Butchart with the help of the ScottishPower Foundation….